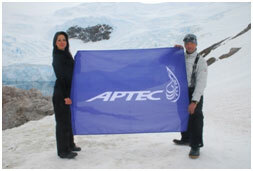 Aptec pioneering environmental sustainability in IT distribution – Antarctica expedition. 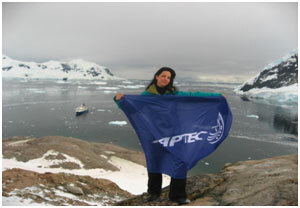 The two-week expedition was organized by 2041 and led by ACORE, American Council on Renewable Energy. 2041 was founded by polar explorer, environmental leader and public speaker Robert Swan, OBE, the first person in history to walk to both the North and South Poles. Swan has dedicated his life to the preservation of Antarctica by the promotion of recycling, renewable energy and sustainability to combat the effects of climate change. Human activities in Antarctica are governed by an international agreement known as the Antarctic Treaty System, established in 1959. This unique international agreement ensures that Antarctica is used for peaceful purposes only and that the environment is protected. Currently there is a moratorium in place that bans drilling or mining in Antarctica called the Environmental Protocol, established in 1991. This document can be reviewed after the 50-year anniversary in 2041. As the year 2041 quickly approaches, Robert Swan’s goal is to ensure that the young people and leaders of today make sustainable decisions for tomorrow. •Operations: improving our own resource efficiency and changing the way we work, encouraging our employees to reduce their environmental impacts at work and at home. •Awareness: creating awareness in the market about sustainability issues and making efforts to promote low-carbon solutions and products in IT channel ecosystem which will help our customers to use less energy and reduce carbon footprint.